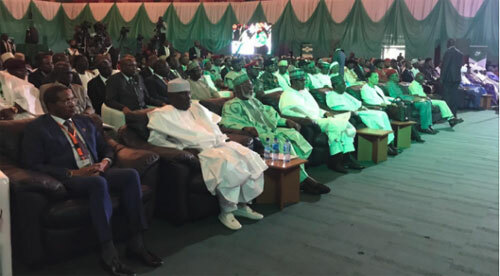 ABUJA—PRESIDENT Muhammadu Buhari on Wednesday in Abuja appealed to all the Presidential candidates in the February 16 election to commit to the ideals of the peace accord for a rancour free contest. President Buhari made the appeal when he and other Presidential candidates including the former Vice President and Presidential candidate of the Peoples Democratic Party, PDP, Alhaji Atiku Abubakar signed a second peace pact. But Atiku Abubakar also told the President to make use of his good office to ensure that every eligible person that cast vote in the forthcoming elections was confident in the process and in the belief that their vote will count. In his remarks at the signing ceremony, President Buhari said that the most important thing about the exercise was for the candidates to accept the final outcome even as he said that the Independent National Electoral Commission, INEC, had already assured that they had done everything possible to ensure free and fair elections. He said even though there was apprehension in the air regarding the general elections, all contestants must understand that it signified that the country was growing politically. The President said that the forthcoming election has expectedly generated anxiety, adding that it was a typical of any form of competition and contest, no matter how well prepared all contestants and regulators are. He said the elections were very special and significant for the growth of the nation’s democracy. According to him, “Another election is upon us and not unexpectedly, there is anxiety in the air. This is typical of any form of competition and contest, no matter how well prepared all contestants and regulators are. The forthcoming elections are very special and significant for the growth of our Democracy. “First, they come immediately after one of the most peaceful elections in the history of our country. I am not saying this because I was blessed to emerge as the winner. I am saying there had been a lot of fears and anxieties from within and outside Nigeria about the future of the country. We are hopeful that this is evidence that we are all maturing in our disposition towards electoral outcomes. We see this as an opportunity to grow our sense of political culture in Nigeria. “Secondly, we are witnessing an exciting development in the area of the engagement of our Youth and Women in the democratic process. Hitherto, these groups have often not been in the mainstream of our political competition. It is in appreciation of their contribution that we passed the Not Too Young to Run Bill last year. “The success of the Act is illustrated by the unprecedented number of young men and women who have stepped forward to participate in this process as Candidates at all levels. Significantly, we have witnessed also the emergence of Women as Candidates across the political space. “Thirdly, these elections are taking place against the backdrop of the emergence of an unprecedented number of Political Parties. As of now, we have 91 Political Parties, out of which over 70 fielded Presidential Candidates. Although some Candidates have dropped out of the race, there is no doubt in our minds that our country is moving forward and that our democracy is expanding and also deepening. “I call on all Nigerians to contribute to the building of a viable polity by more active participation well beyond the mere casting of votes. Elections by themselves do not constitute Democracy. It is the spirit of citizenship engagement that utilizes the energy of citizens towards the attainment of good governance. “We have assembled here to mark the final phase of our campaigns and we are now at the doorstep of our elections. The Campaigns so far have gone well and we thank God for that. For the few incidents in which people lost their lives largely through accidents, we pray that God grants them eternal peace. Now campaigns are over and our next assignment is for us all, citizens and contestants alike, to go out and exercise our civic duties. “We, the Presidential candidates are here to sign and commit ourselves to do all that is possible to ensure the success of the elections but most importantly to accept the final outcome. I appeal to my fellow contestants to commit to these ideals so as to keep our country and people safe. “The Independent National Electoral Commission, INEC, our electoral Umpire, has already assured us that they have done everything possible to ensure free and fair elections. 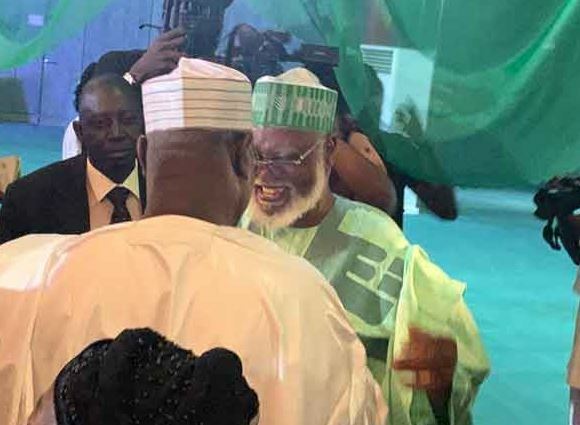 President Buhari also thanked General Abdulsalami Abubakar, Chairman of the National Peace Committee and his members for their efforts in ensuring that the forthcoming elections were peaceful, noting that they contributed in shaping the 2015 elections. He advised the citizens to pray for a successful election and also appealed that the opportunity would be used to strengthen the beliefs in a united country. “Our elections are important only to the extent that they make our country peaceful and prepare us for development. I am making a special appeal to our young people: Do not allow yourselves to be used to cause violence. “Please eschew all forms of violence and cooperate with all the relevant agencies during these elections. We will vote according to Parties, but in the end, the only real Party is Nigeria, our country. Our elections are important only to the extent that they make her strong. Let us do our best and ask God to bless us and our country,” he said. In his remarks, the PDP Presidential candidate, Alhaji Atiku Abubakar commended General Abubakar and members of the Peace Committee for their tireless enthusiasm, dedication, and passion towards ensuring the success of the peace accord process. He said, “Our gathering here today clearly demonstrates the importance of the upcoming elections as well as how our democracy has matured, not only to our people, but also to the international community whose solidarity, Nigeria’s democracy has benefited from. “As we prepare to sign off on this Peace Accord, as representatives of our party and people, may I freely quote the words of former President Goodluck Jonathan, which remains a benchmark, for me, taking into account the deep feelings that prevail as February 16, 2019, approaches. “My ambition is not worth the blood of any Nigerian. In this context, I appeal once again to every staff and the leadership of the Independent National Electoral Commission (INEC) and the Nigeria Police Force, to be fair arbiters in the upcoming elections while letting neutrality prevail. “For emphasis and in the spirit of fair play, I also urge our security agencies, not to embark on indiscriminate arrests of members of the opposition, 24 to 48 hours before elections, as has been the case in previous elections. “Consequently, I also appeal to the President, General Buhari, to use his good office to ensure that every eligible person who casts their vote is confident in the process and in the belief that their vote will count. “Additionally, every candidate must remember that this election is about the future of Nigeria, therefore, we must abide by the will of the people as freely expressed through elections, under the terms of our constitution. “Once again, despite concerns expressed by my party leaders concerning likely electoral malpractices and the intimidation of voters and observers, I trust that our election officials and security services will do their duty in accordance with their oath and obligations. President Buhari at exactly 11:55am, signed the peace accord, after Atiku as well as candidates of other parties had signed the peace accord. They shook hands at the prompting of former President of Liberia, Ellen Johnson-Sirleaf, who is leading the ECOWAS observer mission. The chairman of the national peace committee, former Head of State, Abdulsalami Abubakar said the committee decided to organise the peace accord signing in order to ensure a peaceful conduct for all elections in the country. The Presidential and the National Assembly elections hold this Saturday, February 16th, while that of governors and members of state Houses of Assembly hold on March 2, 2019. 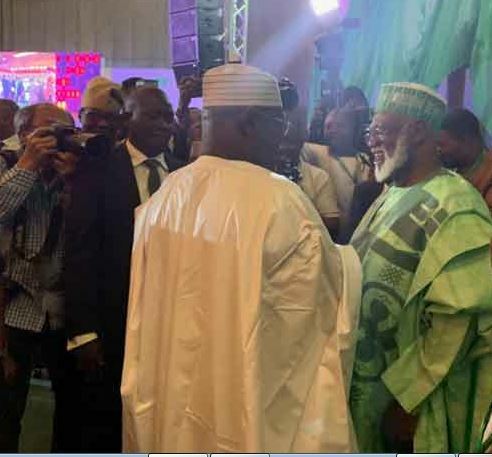 Abdulsalami in his welcome remarks said elections will not hold in the absence of peaceful atmosphere, noting that even governance after election will not be peaceful without a peaceful environment. “Don’t make anything to make a bad situation worse,” he said. He reminded the presidential candidates that by signing the peace accord, they had committed themselves to ensuring a peaceful election in Nigeria and that mere signing of the peace accord would not achieve the required objective “unless all other actors are forced to work with the same rules”. 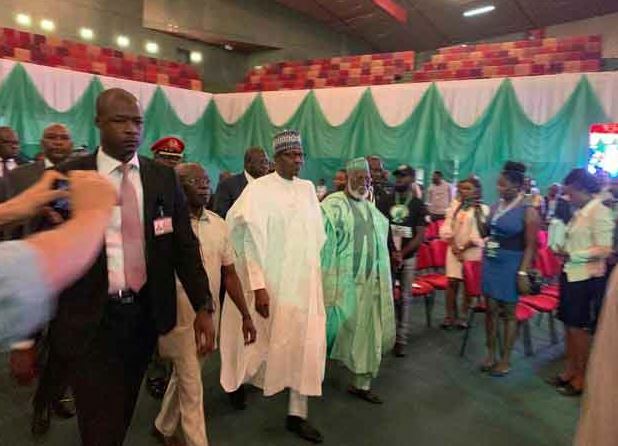 Also speaking the former head of state, Gen. Yakubu Gowon, urged the candidate to tell their supporters to ensure peaceful conduct during the elections so that in the future, there may be no need for foreign observers because the right conduct would have been assured. “May the winner be as dictated from above,” he said. In her remarks, the Secretary General of the Commonwealth, Patricia Scotland said that millions of people across the world were praying for Nigeria and its people hoping that the election will hold peacefully. She noted that Saturday’s election will be the sixth since 1999 when the country returned to democracy after military rule and expressed optimism that the election will entrench and build on the gains achieved since 1999. She said the world was holding their breath because Nigeria was the largest economy with the largest population and that what happens in Nigeria affects all. “It is a burden that Nigerian leaders gathered here today carry. We call on their party, supporters and public to follow their lead. Elections will come and go, but this great Nigeria will remain,” Scotland said. Convener of the Nigeria Civil Society Situation Room, Clement Nwankwo, in his good will message, said it was an opportunity for the country to get it right and he urged security agencies to be neutral. Nwankwo noted that the country had bled tremendously and there was the need to subject their ambition to the will of all Nigerians. He said from the situation room made up of civil society, they will observe the elections and report to Nigerians, give blow by blow account. Among those in attendance at the event were Former Liberian President, Ellen Johnson-Sirleaf, who is leading the ECOWAS observer mission, a former President of Tanzania, Jakaya Kikwete, who heads the Commonwealth observer mission and Festus Moghai a former President of Botswana who is heading the Democratic National Institute and Republic National Institute.